Mark your calendars! 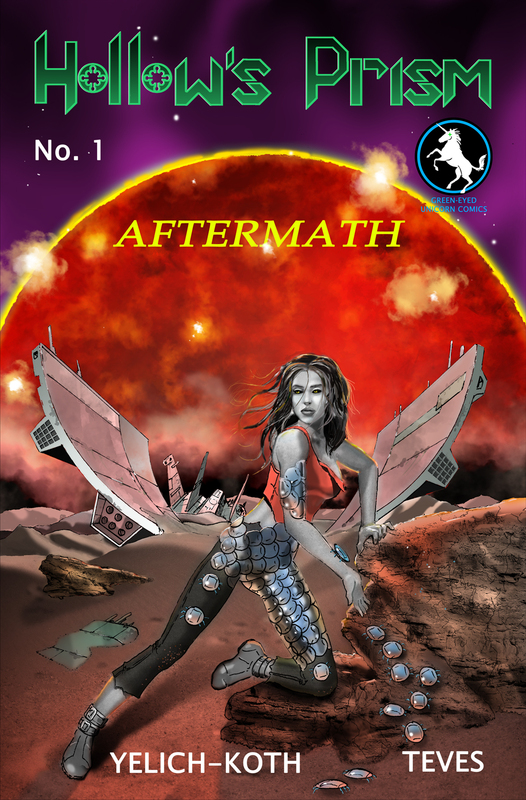 HOLLOW’S PRISM: Aftermath will be launched SEPTEMBER 28, 2013!! That’s right! My second comic book, HOLLOW’S PRISM: Issue #1 “Aftermath“, will be available on September 28th, 2013! That’s just three weeks from today!!! If you get a chance, come in, say hi, buy a copy if you’d like, get it signed, and visit! We’d love to see you there! Thenn spent five years battling the tyrannical Chears, when her crew mutinied and left her to die on a wasted planet. PS- Stay tuned for fun contests and giveaways revolving around the launch! i’m just sorry i have to miss it. good luck, hope you have fun, and enjoy, enjoy, enjoy! I’m sorry you have to miss it, too! Thanks for the luck!! Super cover – looking forward to the release and my copy!!! Keep ’em coming!! Glad you like the cover! There will definitely be a copy saved for you! !